DJs can put in some long hours as they spin the tunes and they need equipment that is both comfortable and rugged enough to withstand heavy use. These Monoprice Pro Headphones are designed for the professional sound spinner and the casual listener that wants the best quality sound and best durability available. The earpieces on these ‘phones are equipped with thick, comfortable padding that keeps the music inside and the noise outside. They swivel up to 90 degrees so they can double as a makeshift set of speakers. The headphones can extend up to 1.5″ on each side and are wide enough to fit over a cap, while maintaining good contact over the ears. The headpiece is also padded on the inside and is made of flexible rubber, ensuring that it won’t break. The headsets do not have a fixed wire. DJs can put in some long hours as they spin the tunes and they need equipment that is both comfortable and rugged enough to withstand heavy use. 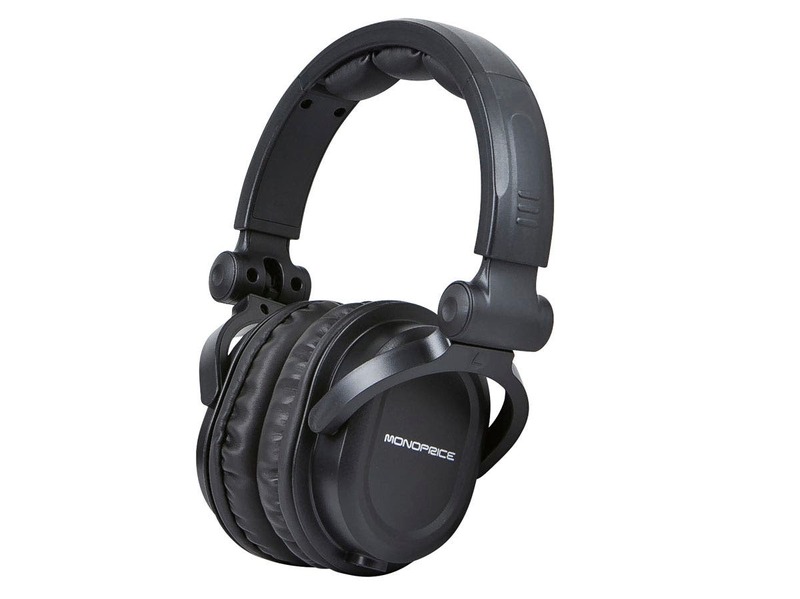 These Monoprice Pro Headphones are designed for the professional sound spinner and the casual listener that wants the best quality sound and best durability available. The earpieces on these ‘phones are equipped with thick, comfortable padding that keeps the music inside and the noise outside. They swivel up to 90 degrees so they can double as a makeshift set of speakers. The headphones can extend up to 1.5″ on each side and are wide enough to fit over a cap, while maintaining good contact over the ears. The headpiece is also padded on the inside and is made of flexible rubber, ensuring that it won’t break. The headsets do not have a fixed wire. Instead, there is a 3.5 mm jack in the bottom of the left earpiece, which allows a standard 3.5 mm audio patch cable to be inserted. This means that if you break a wire, you don’t have to throw away the headphones or make a messy repair; just get a new cable and you’re ready to rock again! The 50 mm drivers and 100 dB sensitivity ensure that these ‘phones produce good volume and premium sound clarity at all frequencies. The kit comes with a 3.5 mm to 1/4″ gold-plated adapter plug. Also included are two 4-foot 3.5mm audio cables. One is a standard 3.5mm TRS cable for casual listening with all audio devices. The second is a 3.5mm TRRS cable with a single-button inline microphone/controller that allows for play/pause control and phone answering capability on all types of devices (iOS� and Android�). High-quality sound, supreme durability, and maximum comfort. These ARE the ‘phones you’ve been looking for! Thank you choosing Monoprice through our eBay online store. *Inquires will be responded to within 2 business days. All returns, whether for refund or replacement, require a Return Merchandise Authorization (RMA). To obtain a Return Merchandise Authorization Number, please setup a return request through your eBay account. Monoprice does not directly ship to International addresses; these orders will be processed through eBay’s Global Shipping Program.